Have you ever felt like you’re just surviving? Just barely making it through? I’ve felt that way many times. And, I have wondered: When I’m just surviving, is God still paying attention to me? If I don’t feel much excitement, and I’m tired, discouraged, or depressed, does God get angry at me for feeling that way? After all, I have had my share of those times. I’m much more stable now than I used to be, but I still have moments where I just want to throw in the towel. On everything. And if so, do you feel like God must shake His head, roll His eyes, and look elsewhere until you pull yourself together again? That’s the treatment I used to feel like I deserved from God. And every time I have struggled with discouragement or depression, I have known that those feelings weren’t God’s plan for me. But there have been times when I haven’t had the courage to fight anymore. Related: Read about one time I lost my will to live here. Who among you fears the Lord? Who obeys the voice of His Servant? Who walks in darkness and has no light? Let him trust in the name of the Lord and rely upon his God” (Isaiah 50:10). First, God is acknowledging that you do revere Him (fear Him in a good way). Secondly, He’s acknowledging that you do obey His voice. Then, He says He has noticed that you’re walking in darkness and have no light. You may not know where you are in life, what your life means right now, or what direction to take. Maybe you’re tired and discouraged. Maybe you don’t see any light at the end of the tunnel. If any of these things apply to you, God is speaking to you. He has more to say, though. God still cares about you when you’re just surviving. He loves you just as much right now as He does when you are fired up, strong and enthusiastic. Your loving Papa knows you may feel weak and dark sometimes, but He wants you to know that it will be ok. He’s got you covered. He will take care of you. Even if you feel hopeless, sad, or uncertain right now, God will be faithful to you. I love that; don’t you? Should we be happy? Yes; and God will continue to grow you in happiness and joy as you walk with Him. But if you’re not happy right now–if you’re just surviving, walking in darkness and having no light–God still cares about you. He knows your name. He knows where you are. He is mindful that you are but dust (Psalm 103:14), and He hasn’t cast you aside. He wants you to know that He’s going to come through for you, because God cares about you when you’re just surviving. Do you feel like you’re just surviving right now? If so, would you take a moment to tell the Father about how you feel, and ask for His help to trust and rely on Him? He will help you. Image courtesy of Alexander Ekman on Flickr via Creative Commons license. 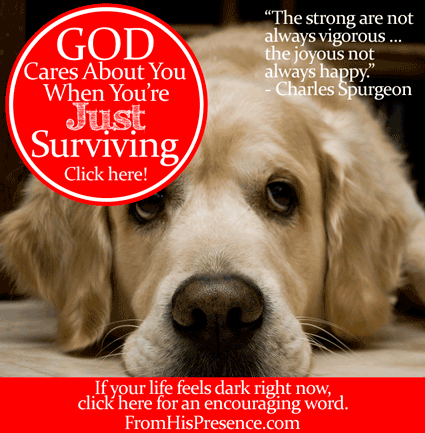 I have personally been living in survival mode for several years now, which is a different place for me. However, God is SO with me and still at work and blessing this season differently. He is so good and I know the testimony of this period will continue to be a strong one. Thanks Jamie! Thank you for the article. I needed this right in the moment i saw it. This is exactly where I have found myself for the last 25 years! I know God has been with me, still loves me, there have been rather short periods where things have been somewhat better…… and Lots of hard times when I wondered where He was, why I was allowed to go thru so much, why my prayers were answered in small ways, but never the deliverance I begged for! Thank you. For about a month now I feel like, I don’t want to talk to God because I don’t know what’s going on. I’m avoiding Him. Even though I love Him, he’s truly my only hope and very life, has been since I was a child from an abusive background. I’ve been taught that if I don’t pray God won’t do anything or that he can’t do anything. That’s a bad life for me to hear because some of the abuse was punishment and neglect (“lost child”). We love him because he FIRST loved us. While we were still sinners HE … thank you very much for your post- please pray for me? Suzanne-HE knows what’s going on and it can take some time in the spiritual realm to get things going down here.There was a prophet who fasted and prayed and it took 45 days,i think to answer his prayer.When he asked why so long God answered that he had to work things out in spiritual realm with his angels,etc.Don’t stop praying!Knock and the door will be opened/seek you shall find/ask and it shall be given to you…Also,make sure to ask to do God’s will in your prayers and he then will answer you because you are in accordance with his will.Plus,ask for the holy spirit to guide you when reading scripture/coming accross scripture EVERY DAY.If you don’t go a day without eating well …you don’t go a day without scriptures+prayer!Take the time to pray+read scriptures when you are at your best in energy-to GIVE your best to God and make him FIRST in priority!Also,go see a doctor if you have depressive issues/anxiety and the like.In proverbs 23,it says that sometimes God sents us to the doctor.I definitly agree and experienced this!Don’t forget,you are defined by Christ,not your sins and any abuses that happened to you!YOU are a NEW CREATURE in Christ!Let’s just say God loves you …TO DEATH…ON THE CROSS YES! Jamie, you are an amazing child of God. Thank you for your ministry. I love the Lord so much and all I want is to please him. I am so full of healing possibilities it is unreal. I can use prayer for my family relationships, and my emotions and how this situation keeps bothering me with my health issues. Thank you, Jamie! You’re posts are such a blessing to me! May God continue to pour out His love, favor, wisdom & blessings upon you and your family. Thank you for your obedience to Him & in the kingdom. May His kingdom promises and riches be multipled to you & yours. LORD, help me to trust and rely on YOU for my very being…AMEN? Sometimes it’s just HEEEELP!And God will understand.The times we don’t know how to pray,the holy ghost helps us:”In the same way, the Spirit helps us in our weakness. For we do not know how we ought to pray, but the Spirit Himself intercedes for us with groans too deep for words.”Romans 8:26.Prophet Eli didn’t say too much either after running form queen Jezebel-kill me!LOL!God helped him get back on his feet when he was depressed and down/out.Thanks be to our father that he does do that with us! So inspirational, encouraging and hope filled. 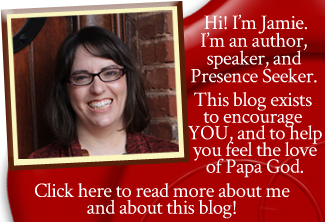 Thank you Jamie for your transparency and timely posts with pearls of truth that you strand together so well. Truly blessed and thankful for you.